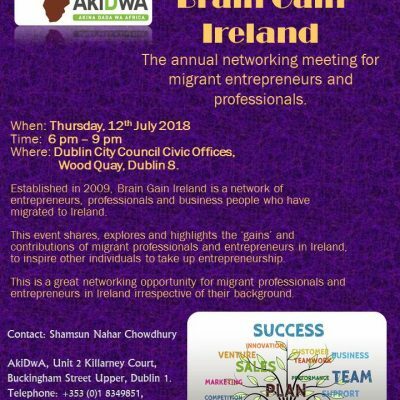 Brain Gain Ireland The annual networking meeting for migrant entrepreneurs and professionals When: Thursday, 12th July, 2016 Time: 6pm – 9pm Where: Dublin City Council Civic Offices, Wood Quay, Dublin 8. AkiDwA Open Day Embracing Diversity and Inclusion 28th June 2018 10am – 3pm Community Hall; Killarney Court, Buckingham Street Upper, Dublin 1. Besides AkiDwA offices.